"How can I be more proactive?" MG and HE tackle this powerful and common question from a number of vantage points, starting with the late, great Dr. Stephen Covey and his all-important "Effectiveness Quadrant". Martin shares that by drawing out this diagram yourself it can provide a very basic and visual framework for anyone to organize those things in their life that are IMPORTANT but NOT urgent. And, addressing those consistently is the KEY to effectiveness. The challenge for most of us is that we spend so much time in the "URGENT" and "IMPORTANT" quadrant, which is Quadrant #1. And ultimately, we begin to confuse "busyness" for effectiveness and then, unfortunately the really import work we need to be addressing is neglected. Stickk - Be held accountable! It appears as though Fia's entire career was leading her towards her current vocation, a professional speaking coach. After years in New York working as a trained actor she began working with the 52nd street playhouse which taught arts, dance and theater to inner-city youth in Harlem. Then, with her masters she began teaching at UCSD and was asked to help develop their public speaking curriculum. Today, Fia is a regular columnist for Inc. magazine online and she runs her company, The Moxie Institute which is a powerful resource for businesses and executives looking to become better speakers. In this episode Fia recounts her natural progression to her current career and covers all those natural challenges most speakers share, including how evolution has us wired to naturally fear public speaking. Then of course, Fia shares some great tips about how we can address and overcome those fears. Martin shares how his latest experiment, abstaining from alcohol for just one month (unable to have a beer or two a night) then evolved into another behavior experiment, a modified low carb/diet. Both of these he explains were fairly painful yet, the fruits— the rewards of each have been fantastic! "It's kinda like the frogs that are boiled to death in the pot as they are slowly cooked. The temperature rises slowly, one degree at a time and they never notice or try to escape until it's too late. The frogs are just too comfortable until, of course, they are dead." "There are two great pains in life," Jim Rohn is famous for saying. "The pain of discipline or the pain of regret." "Discipline" he assures us "weighs ounces but regret weighs tons." The bad news is there is no escaping the pain. The good news is we have a choice. And, the best news is; you should know that there is tremendous FRUIT on the other side of that pain and challenge you put yourself under! Ideally, we don't want to arrive at the end of our lives thinking "I SHOULD HAVE" tried this, learned that, only to realize we have wasted too much time and most of it in a perpetual mission to stay "comfortable". Keep experimenting— keep leaning into the pain and discomort the great challenges that will make you better. You're far stronger and more resilient than you know and you won't ever know if you don't try! P.S. : ANYTIME YOU CHANGE / MODIFY YOUR DIET FIRST seek the advice of a medical professional. This is not an endorsement of any particular diet product or plan. Brian Tracy has famously said, "Comfort is the great enemy of success." So, the question is, "HOW COMFORTABLE ARE YOU?" Reis Paluso is an amazing young man. Martin knows this well as Reis was one of his first "campers" way, way back in 1994-5 at Kreative Kids Computer Camp (Poway/San Diego). Martin recounts Reis' amazing computer skills as a young lad and reflects on the joy and challenge of his first "real" entrepreneurial venture with his amazing partners (partners MG still has to this day). Reis shares in the Kreative Kids memory; learning HTML, multi-media skills (in the early days of the internet) and of course how he became a 46 wpm typist, at age 12! However, the MEAT of the this episode is all about Reis' and his recent voyage into the icy mountains of POLAND (bordering on Czech Republic). He ventured there in a quest to learn and experience the Wim Hof Method at an advanced level retreat. And, Reis confirms, this experience really elevated (so to speak) his Wim Hof practice to a whole, new level. (See links below for more about Hof himself). After many days in an entirely foreign environment, RP shares how he had an emotional "release" really a massive personal breakthrough that he'd never anticipated and it was a direct result of this endeavor which culminates with him hiking up Mount Snezka (in -15C or, 5ºF) shirtless, with just shoes and shorts on!! MORE BOOKS MENTIONED IN THIS EPISODE! It seems we address certain types of learning differently than say preparing to perform. In other words, to prepare for a performance we will practice, practice, and practice some more. But, when it comes to learning something we expect to see or hear it once and completely know it and be able to recall it. Crazier still, we tend to think we're not too smart if we need to relearn the same lesson over and over again. MG and HE challenge this idea. MG recalls how some of the audio lessons on his playlist he’s heard "hundreds" of times! The EXACT SAME lesson. And, he says, here's the “crazy” thing— each time he seems to pickup and learn something new. Why is that? How can you or I hear the same message three times, for instance, and learn or pickup something different each time? They cover the various reasons behind this phenomena and then, ultimately, propose this is precisely what higher education is about— for instance what PhD students do! They study the SAME SUBJECT over and over and then again, some more. They GO DEEP vs wide (breadth) and cover the same topic from different angles and perspectives. And, because of this, they notice details, nuances and connections most people will never see. This, learning the same things over and over and then some more, is really what we call expertise. This is what mastery really is! Today's topic involves the age-old quest for humans to BE HAPPY! That's it! "How can I be more happy?" Or as the title of the show suggests, "What's the quickest way to happiness?" As you might guess MG and HE have a few thoughts on the matter. Henry starts with a great recount of friend who "wasn't particularly happy" and gives him an exercise to perform. MG recounts a semi-related parallel story shared by the late, great Dr. Wayne Dyer. Then they go off. The list of tips gets long enough for Henry to exclaim, "I think there's a formula here!" What is success? How do you define it? Henry and Martin get DEEP into the subject of SUCCESS. What is it really? And, crazier still, how do YOU define it!? Don't think it's important? This about this: It's a given that 100% of people want to become a “success”. Yet, the large majority of people haven’t even taken the time to define what success means. Do you have your own definition of success? Have you refined it and studied it? Remember, it's very difficult to hit a target that you can’t see! Other definitions of success are explored: Earl Nightingale's "Success is the progressive realization of a worthy ideal." And, Thoreau's "If one advances confidently in the direction of their dreams and endeavors to live the life they imagine, they will meet with a success in common hours." It took Coach Wooden many years to find his correct formula. In 1934 he decided on the cornerstones, Industriousness and Enthusiasm, the two most important building blocks of the pyramid. Completing the foundation of the Pyramid are Friendship, Loyalty and Cooperation. 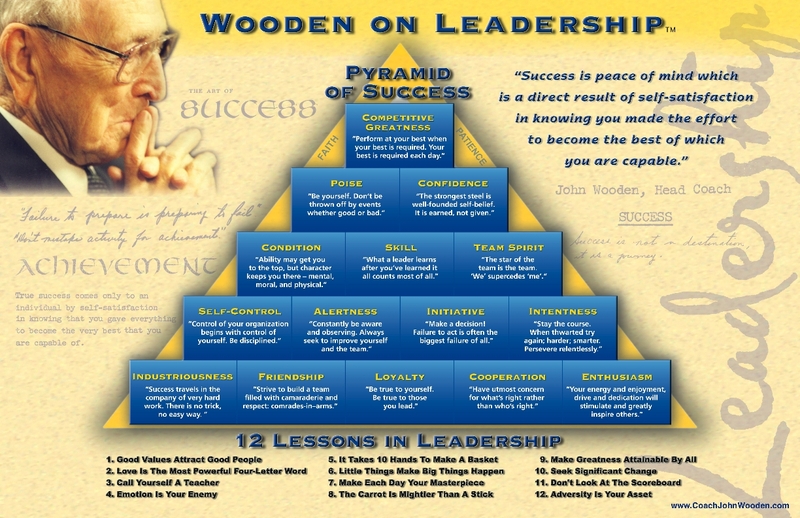 As the years went by, Coach Wooden built his Pyramid upon 14 building blocks of essential virtues (habits), leading to the apex, the final, 15th building block - Competitive Greatness. On both sides of the Pyramid, in essence holding it together, are 10 words, including Ambition, Honesty and Integrity, once again all leading to the top, where Faith and Patience watch over Competitive Greatness. Coach Wooden completed his 'Pyramid of Success' in the spring of 1948, and the original Pyramid drawing was on his office wall after he accepted the men's basketball head coaching position at UCLA that same spring. "The best way to improve the team is to improve ourself." "Goals achieved with little effort are seldom worthwhile or lasting." "As long as you try your best, you are never a failure. That is, unless you blame others." "Much can be accomplished by teamwork when no one is concerned about who gets the credit." Great books by and about the legend! Thanks for checking out, sharing, subscribing and reviewing ; ) this podcast! Martin and Henry discuss a topic that has many of even the top behavioral psychologists in the world have a difficult time addressing, that is, how habit and skill differ. Think about it, is tying your shoes a skill or a habit? Or, is it both? Martin argues that rather that trying to explain their differences we ought to put more emphasis on why they are almost the same, fraternal twins so to speak. This matters because when we do that we can quickly dispel so many of the silly myths around habit development. For instance, that you need a reward to develop a habit or you have to perform the behavior every day or the classic myth, it takes 21 days to develop a habit. Just insert the word "skill" for habit and you can see how silly that becomes. Do you need a "reward" to develop a skill? Or, we know we can learn any skill without practicing/learning it daily. Or, imagine telling anyone you'll have that skill in 21 days. So, rather than fully accepting Covey's theory and statement above, where "Skill" is a requirement for habit development. Martin tweaks it just a little so that skill is not a requirement but rather part of what is developed/created in a similar way as habit. Meet Cathey F! An amazing woman and a long-time THF reader, app user and podcast listener. MG begged her to share her story about her semi-recent struggles and how she was able to breakthrough. Cathey was in "total overwhelm"... trying to start a new business in the midst of a potential health crises, changes in her community, social circle and other difficulties made even tracking a few habits just too much. Then, she signed up for a "Focus & Discipline" webinar hosted by MG and shares how some of that content combined with tracking certain key habits proved to help feed her ongoing breakthrough. Every reader/listener is going through a challenge or will be! Her willingness to share her experience is likely to help others and bring great value to the audience! Brilliant job — thank you again Cathey!